If you choose to live on campus you are steps from classrooms, libraries, and athletics facilities. Living on campus is a fun and enriching experience. You can live in one of the dormitories on the York University campus, within walking distance of classrooms, gym facilities, on-campus restaurants, student centres, libraries, and computer labs – everything right outside your door. The York University Security Control Centre is open 24 hours a day / 365 days a year to keep you safe, and houses a dispatch centre, Closed Circuit Television (CCTV), alarm monitoring equipment, and a first aid station. Long distance telephone calls can be made with the purchase of a phone card. Residence includes laundry facilities, as well as communal kitchens. Cooking is not permitted, but students can rent small fridges for their rooms. Residence is a smoke-free environment, and smoking is not allowed indoors, as per Ontario law. 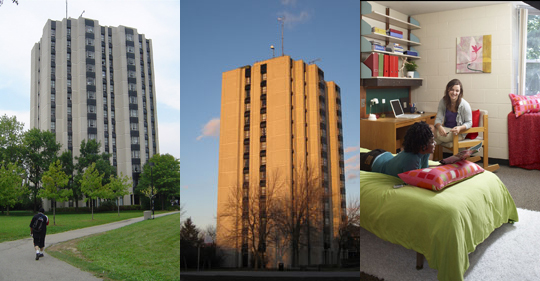 The York University campus is a vibrant, self-contained community with much to offer, and many things to do. Check out our facilities. York University and English Language Institute offer an airport welcome and transportation service for English Language Institute international students and visiting scholars. Students who have made a reservation and submitted the fee will be met by a CampusServus employee with York University signs in the airport’s arrivals lounge and transported to their residence on either of York’s campuses, or to another address in the Greater Toronto Area. To make a reservation or find out more information, please click here.